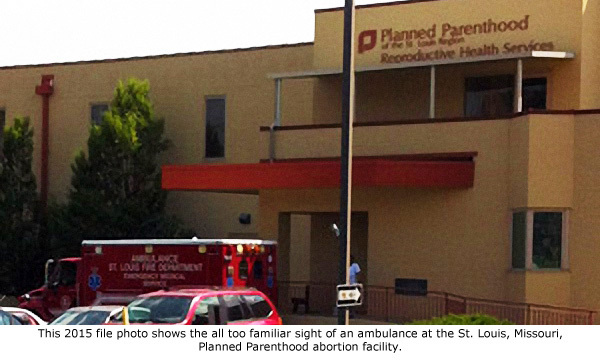 St. Louis, MO — Mary Maschmeier, President of Defenders of the Unborn, has reported that an abortion patient of the Planned Parenthood facility in St. Louis, Missouri, was transported by ambulance to a local hospital on Friday, May 13, 2016, at about 3:00 p.m.
Maschmeier told Operation Rescue that the patient suffered a “botched” abortion that represents the 31st abortion-related medical emergency documented at the St. Louis Planned Parenthood since 2009. Operation Rescue has declared it among the most dangerous abortion facilities in America. That Planned Parenthood office is the only remaining abortion facility in Missouri. It recently came under investigation by the Missouri Interim Senate Sanctity of Life Committee, which discovered that aborted baby remains from that facility were being illegally dumped in Indiana. The committee issued subpoenas to Mary Kogut, CEO of Planned Parenthood of the St. Louis Region, and James Miller, owner of Pathology Services Inc., (the pathology company used by Planned Parenthood’s high volume St. Louis abortion facility), seeking information about tissue disposal policies as well as the numerous medical emergencies that regularly occur at the St. Louis facility. At first Kogut and Miller resisted the subpoenas, but once contempt proceedings were initiated by the State Senate, Kogut capitulated and agreed to turn over documents. Miller, whose pathology business would have been responsible for shipping the aborted baby remains out of state, took advantage of his Fifth Amendment right not to incriminate himself. Little is known about the nature of most of the medical emergencies that take place at the St. Louis Planned Parenthood, including the most recent incident. Emergency 911 records can shed light on why women are being injured, but these records have been denied to Operation Rescue by the St. Louis Fire Department. In order to preserve the right of the public to access public records, Operation Rescue sued to access the 911 records. That case is ongoing.